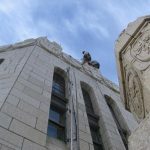 Vertical Access performed the hands-on inspection of the exterior terra cotta and brick of the LeVeque Tower as part of the restoration of the landmark building. 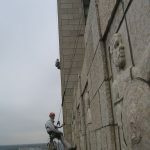 The rope access inspection included 500 foot “drops” on the tower and up close encounters with the ornamental figures at the exterior. 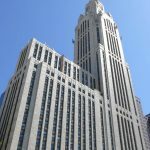 Designed by the noted theater architect C. Howard Crane, the 48-story LeVeque Tower rises over 555 feet into the air, taller than the Washington Monument and the tallest building between New York and Chicago when it was constructed for the American Insurance Union in 1927. The ornamental terra cotta was created by Chicago sculptor Fritz Albert, the chief modeler of the Northwestern Terra Cotta Company. Although the building has Art Deco touches, mainly in its interior, classical references are the dominant ornament on the exterior. 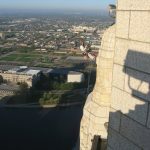 After the American Insurance Union went bankrupt, the “AIU Citadel” was purchased by John Lincoln and Leslie LeVeque in 1945 and became known as the Lincoln-LeVeque Tower. 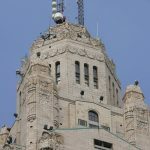 After 1977, the building was officially renamed the LeVeque Tower, with the LeVeque family retaining ownership until 2004. 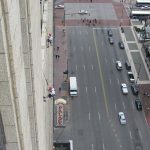 Between 2004 and 2011, the building changed hands multiple times. 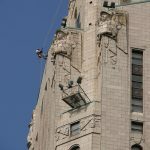 In 2011, the building was acquired by Tower 10 LLC, who is leading the effort to restore the landmark structure. 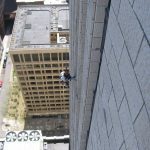 Work around powerful radio frequency antennas at top of building. Document faults and deficiencies to assist large project team with assessment of conditions and preparation of repair documents. VA worked with the project team to evaluate the radio frequency issues of the site. Following hands-on survey, VA uploaded all the survey data to a web portal for sharing project information between team members. Identify blind delamination within limestone units. 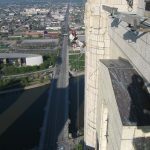 Document faults and deficiencies at the upper portion of the tower to assist with quantification of repairs.